At the beginning of 2019, Lil Uzi Vert announced that he was retiring. He was frustrated with his label situation and with the hoops he needed to go through to drop new music. In an Instagram post he said, “I deleted everything I wanna be normal. I wanna wake up in 2013.” This frustration was not exactly new to Uzi, who preferred to release music when he felt like it, instead of adhering to the outdated and often slow release schedule the music industry typically adheres to. After losing his phone while crowd surfing at his own show a couple years ago, he more or less lost the files to an entire album, and decided to just drop some of the songs on SoundCloud instead. 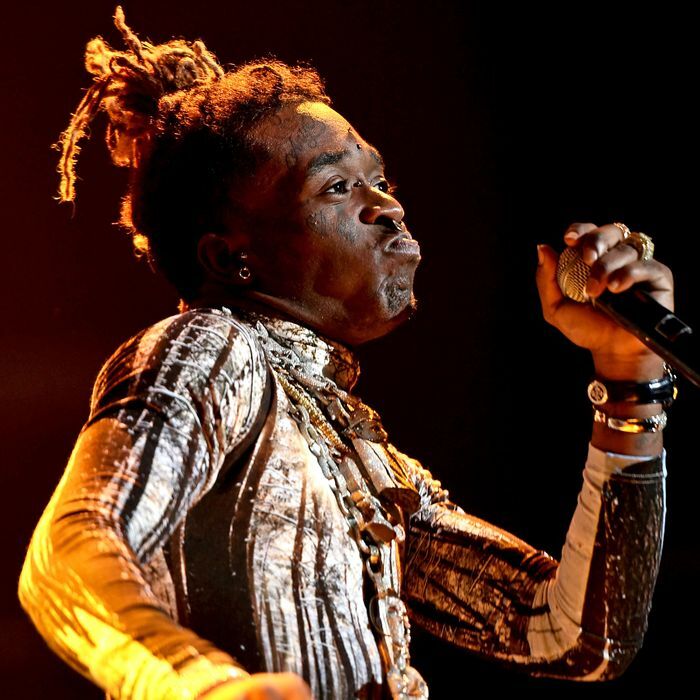 The appeal of the instant connection of this method is obvious, and Uzi knows how to write a hit without label interference. In a just world, we’d have some version of Uzi’s sophomore album, Eternal Atake, by now. It is still extremely odd that one of the biggest rap stars around has released such a small amount of music since the buzz around him began to surge, then surpassed critical mass. Uzi, like Young Thug or Gucci Mane or Lil Wayne, can be extraordinarily prolific, often writing and recording songs faster than a label can figure out what to do with them. It makes sense that he’d want to release songs or albums as they’re finished, without any delay. In the modern rap landscape, artistic evolution happens in plain sight. Process is laid bare. Quantity is conflated with quality, and it doesn’t even matter. Don’t like one mixtape? That’s okay, there’s another one right around the corner. Which brings us to “Free Uzi,” a song that Uzi’s label, Atlantic Records, says is actually a leak (notably, it’s not currently available on Spotify or Apple Music) — one which Uzi himself is reportedly (and unsubtly) responsible for. (Coincidentally, he promoted the song on his previously blacked-out Instagram at the same time the song leaked and, later, shared an official music video. The song is also currently available on Tidal, which is famously owned by Jay-Z, whose label Roc Nation has reportedly intervened to manage Uzi’s career going forward.) The title is self-explanatory, and the song is a furious three minutes of breathless rapping, a reminder that Uzi’s got an uncanny sense of melody and timing, and is firmly part of the Philadelphia lineage of rappers who are really good at sounding like they don’t really ever need to breathe. Even without all the label drama and retirement rumors (did anyone really believe Uzi was really going to retire? How many artists in the history of music have actually stopped making music forever after they said they were going to? ), “Free Uzi” is a compelling song. It doesn’t feel like a single. It doesn’t have the undeniable hook of, say, “XO Tour Lif3,” but that also doesn’t really matter. Uzi now exists in a rarified space where the demand for new music from him far outstrips the available inventory. His influence looms large enough that a song like “Free Uzi” can take on a sort of instant cult status. The story behind the song means more than the song itself. Luckily “Free Uzi” is worth more than a few listens anyway. 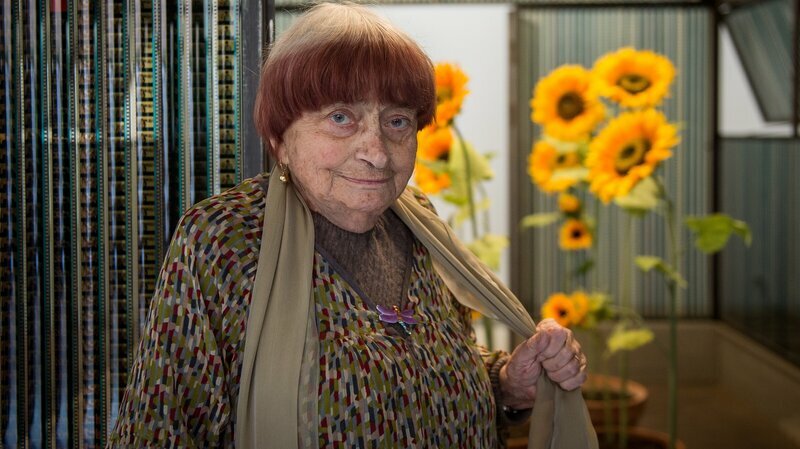 French director and artist Agnès Varda has died. She’s seen here posing next to her installation “La serre du bonheur” at the Chaumont-sur-Loire castle on March 23. French film director Agnès Varda, who was a pioneer during the new-wave revolution of the 1950s and ’60s and who kept making important films for the next five decades, has died at age 90. As a director, Varda had a photographer’s eye for capturing striking images — a skill she often used to accomplish the feat of allowing her stories to seem as if they told themselves. But behind the camera, a master was at work. Varda released her first film, La Pointe Courte, in 1955, on a shoestring budget and with no formal training. She even claimed not to have seen very many films before writing and directing what is now seen as a classic of cinema. Varda may have lacked experience, but as she started out in her 20s, she believed that while other arts had progressed to new heights, films were still telling stories the way they always had. La Pointe Courte tells the story of a Parisian couple visiting the husband’s modest hometown, a small fishing village. As the relatively simple story unfolds, viewers can feel a guiding intelligence through Varda’s meticulous staging and framing of shots. Shot in black and white, two main narratives emerge, much as in William Faulkner’s The Wild Palms, Varda’s inspiration for the film. “Varda’s authorial control over both scriptwriting and directing, the exclusive use of location shooting, the mixing of professional and nonprofessional actors — all of this was groundbreaking in early 1950s France,” Ginette Vincendeau wrote for Criterion in 2008. To form her unorthodox approach, Varda instructed her actors to mute their emotions; she spurned artificial lighting; she also allowed off-camera sounds to buzz in and out of dialogue — stylistic touches that became mainstays for the new wave, a movement that includes esteemed directors such as Jean-Luc Godard, François Truffaut and Alain Resnais. Over the years, appreciation for Varda’s work has only grown. In 2017, she was awarded an honorary Oscar for lifetime achievement. That followed her Palme d’honneur, a lifetime award from the 2015 Cannes Film Festival. As she explored her art, Varda kept a steady eye on important social themes, particularly the role of women. And she frequently turned her lens onto revolutionary ideas, filming in Cuba in 1963 (for 1971’s Salut les Cubains) and making a short documentary about the Black Panthers in 1968. Varda’s well-respected films range over decades, from 1962’s Cléo from 5 to 7 and 1965’s Le Bonheur to 1985’s Vagabond — the story of a young woman living alone, constantly on the move. Cléo is seen as an icon of the new wave, telling the story of a young pop star who meditates on beauty, femininity and objectification — all while rushing through Paris and awaiting the results of a biopsy that could tell her whether she will die from cancer. In 2017, Varda co-directed Faces Places — a project that paired her with the installation artist JR, as the unlikely pair (with a 55-year age difference) traveled to small towns and villages in France and treated the locals like larger-than-life personalities. Varda turned the camera on herself for several projects, including the autobiographical The Beaches of Agnès of 2008 and Varda by Agnès, which came out this year. Born Arlette Varda in Brussels in 1928, Varda changed her name as she embarked on her career in art. While she is often associated with the Parisian arts scene, she also spent time in Los Angeles, where she moved in the late 1960s along with her husband, the late director Jacques Demy. Even in Varda’s autobiographical film, she turned the camera on others. Billie Eilish has done the same interview, one year apart, but how much does the ‘Bury A Friend’ singer’s life change ten minutes apart? #BillieEilish #BuryAFriend See Vanity Fair’s original Same Interview, One Year Apart now: https://www.youtube.com/watch?v=Cm0MGnuRnH0 Read more about when Billie dropped by Capital: https://www.capitalfm.com/artists/billie-eilish/same-interview-ten-minutes-apart/ Subscribe: http://bit.ly/SubscribeToCapitalFM Get involved with the UK’s No. “I’m the bad guy,” Billie Eilish declares in “Bad Guy,” the first song on her debut album, “When We All Fall Asleep, Where Do We Go?”; then the music pauses to splice in one spoken, very teenage syllable: “Duh!” You can hear the eyeroll. Eilish, 17, has spent the last few years establishing herself as the negation of what a female teen-pop star used to be. She doesn’t play innocent, or ingratiating, or flirtatious, or perky, or cute. Instead, she’s sullen, depressive, death-haunted, sly, analytical and confrontational, all without raising her voice. On singles and EPs, like her 2017 EP “Don’t Smile at Me,” Eilish’s songs have treated love as a power struggle, an absurd game, and a destructive obsession, racking up more than a billion streams from listeners who apparently share her sentiments. On her Instagram page, which has more than 15 million followers, she is brusquely anti-fashion, swaddling herself in shapeless, oversized, boldly colored clothes and making silly or ghoulish faces. “I do what I want when I’m wanting to/My soul so cynical,” she notes in “Bad Guy.” But that’s just her starting point. While Eilish’s previous releases have featured her flinty, defensive side, her debut album also admits to sorrows and vulnerabilities. In some ways the album arrives as a continuation, not an introduction. Like her previous releases, it’s the work of a very small, decidedly innovative family team. Eilish writes and records her songs with her older brother, Finneas O’Connell, working largely at home. The sound they have built for her is sparse with instrumentation and large with implication. A typical track uses just a handful of parts, nearly all of them electronic: a bass line, a beat, only enough keyboard notes to sketch a harmony. Eilish sings barely above a whisper, a signal of intimacy. But at any moment, the tracks are likely to flaunt their artificiality: adding samples or sound effects, distorting her voice, suddenly deploying a big bass drop. “Wish You Were Gay” — a guy is ignoring her, and she wishes he was indifferent to her gender rather than her in particular — starts with just acoustic-guitar chords and her voice, tokens of pop sincerity. But the mix also includes a tittering audience and applause at the end, insisting that the song is archly theatrical. In Eilish’s digital-native universe, it’s impossible to pretend that anything is unobserved or unmediated; everything is self-conscious. While albums in the streaming era aren’t always made to be heard as a whole, “When We All Fall Asleep, Where Do We Go?” traces a clear arc: from bravado to melancholy. Early in the album are songs like “You Should See Me in a Crown” — an ominously assured, sustained and then slamming claim to power — and the mocking, music-hall flavored “All the Good Girls Go to Hell,” as well as “Xanny,” a ballad that disdains the trendy overuse of the anti-anxiety drug Xanax. But with a stretch of songs near the end of the album, Eilish turns to thoughts of grief, suicide and loneliness. Eilish began her career establishing what kind of pop star she doesn’t intend to be. With her debut album, she’s even tougher: tough enough to show some heart. Siegfried & Roy dazzled Las Vegas audiences for years, but it all ended in 2003 when a tiger nearly killed Roy Horn during a performance. Now, trainer Chris Lawrence, who helped save Horn that night, is saying Horn himself may be to blame for the attack. Few will forget when a white tiger viciously attacked magician Roy Horn in 2003 during Siegfried & Roy’s Las Vegas show. The attack ended the careers of Horn and his partner, Siegfried Fischbacher, as an audience of 1,500 watched 400-pound tiger Montecore bite Roy and drag him offstage. The explanation has always been that Roy suffered a stroke, and the tiger reacted to protect him. Now, trainer Chris Lawrence has spoken out to The Hollywood Reporter, claiming Roy himself is to blame for the accident. In a long interview, Lawrence says Horn was spending too little time with the tigers before shows, eroding the bond between animal and performer. Lawrence, 45, has been diagnosed with PTSD and says he is recovering from alcohol abuse, night terrors and suicidal thoughts. He tells THR he’s speaking out now to set out the facts before a planned biopic Siegfried & Roy reportedly have in the works. The night of the accident, Oct. 3, 2003, was Horn’s 59th birthday. Because the audience was filled with Horn’s friends, the handler says he persuaded Horn to perform with the impressive Montecore. When the tiger bit at Horn’s sleeve, Lawrence made a move to intervene, tempting him with raw meat. The trainer grabbed Montecore’s leash, and the tiger managed to knock both men down. “I vividly remember thinking, ‘Here he comes,’ and I experienced all of the things that you hear about prior to your death,” he recalls. But the tiger was only interested in Horn, dragging the unconscious performer off the stage. Horn was rushed to the hospital and survived multiple surgeries. Now 74, he has difficulty walking and talking, which a 2005 USDA report said was the result of a crushed windpipe and damage to an artery carrying oxygen to Horn’s brain. Lawrence said the investigators never received his statement detailing his version of events. The show was immediately shut down. Lawrence says he believes Horn has never been confronted about his role in causing the attack and has been shielded from reality. Lawrence worked at the Secret Garden, a small zoo on the property of the Mirage that houses big cats, until three years after the incident, but says he quit because of guilt over Horn’s injuries and his increasing discomfort around animals. Welcome to Emeraude’s secret garden! Go behind the scenes at the cover shoot of “Shadowhunters” actress Emeraude Toubia, for Grumpy Magazine’s ISSUE NO.13. “Soldier” – Firewoodisland | https://itunes.apple.com/be/album/soldier-single/1223045422 Watch the final episodes of Shadowhunters Mondays at 8/7c on Freeform. #ShadowhuntersLegacy What to watch next: more season 3 clips! Prince Royce and Emeraude Toubia are officially off the market! The Dominican bachata crooner and Mexican-Lebanese actress have tied the knot, according to an exclusive cover story published by People en Español on Friday (March 29). Who’s Your Favorite Latin Music Couple? Vote! The news came as a big surprise for their fans. See the beautiful photo below. Andy Cohen is addressing everything from the belt incident between Porsha Williams and Nene Leakes to the demise of Nene and Cynthia Bailey’s friendship. Yes, this RHOA Season 11 Reunion Trailer is everything we’ve been waiting for and more. Porsha Williams and NeNe Leakes are battling it out on social media. The Real Housewives of Atlanta stars both posted to their personal Instagram accounts on Friday, sharing alleged texts they sent each other following a controversial episode of their reality show that recently aired on Bravo. It all started when Porsha posted a series of screenshots from their alleged conversation, in which NeNe seemingly body shamed and bullied the new mom, who just gave birth to a baby girl, PJ, last week. NeNe is referring to a recent episode of their reality series, in which Porsha and Kandi entered her closet without permission. NeNe allegedly grabbed Porsha by her belt and broke it as a way to get her out of the closet, though NeNe denies that ever happened. All of this drama and more will be discussed during the season 11 RHOA reunion, which begins airing Sunday, April 7 on Bravo. In the meantime, hear more on the Housewives in the video below!